Catalog Home > 3M Company > Scotch® Double Sided Tape, 3/4" x 200"
For the light-duty attaching you do for activities around the house, get it done fast and get it done right-without the drips, clogs and air bubbles of glue. Scotch® Double-Sided Tape-the neat, clean, strong and long-lasting way to take care of school projects, scrapbooks, photo albums-all those important presentations that need to come together. 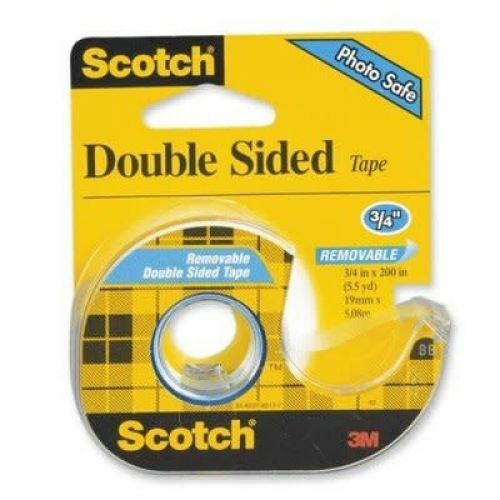 Scotch® Double-Sided Tape is easy to use and won't create a mess like the way glue does. It smoothly glides off the easy-to-use Scotch® Tape dispenser (included), cuts cleanly and right where you want to cut-so no waste. For a better way to present all the wonderful things in life.